A good student jazz-tap for kids who like what the adults wear. Features Bloch Techno Taps. Soft Man-Made upper with similar styling to the BL301 at less than half the price. 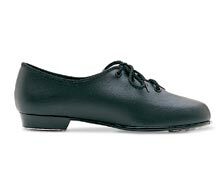 This economy shoe is a great intro to jazz tap styles and perfect for boys. (For sizes 2 buy Adult 4, 2.5 buy Adult 4.5, 3 buy Adult 5 and 3.5 buy Adult 5.5).